The Propeller Brewing Company is Looking for Hopheads! 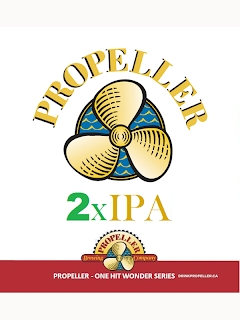 The first One Hit Wonder Limited Release for 2012 is Propeller 2xIPA (Double India Pale Ale) and will be available February 1st at the Propeller Shop in Growlers only. 2xIPA is a full bodied, unfiltered Double IPA that is brewed with ample amounts of premium Pacific Northwest Cascade hops and is paired with a rich blend of 2-row Pale and Crystal malts. Following fermentation it has been heavily dry hopped with Centennial hops giving this bold brew a big west coast nose. 2xIPA delivers a huge amount of piney, floral, and citrusy hop aroma and flavor from start to finish that is moderately tempered by a sweet malt backbone. If you are a "hophead", this one's for you; big, chewy, resiny and fragrant. At 8.3% alcohol by volume and 85 IBUs, Propeller 2xIPA is not for everyone… It is a TRUE hop bomb, for TRUE hopheads! 2011 releases in the One Hit Wonder series included Propeller Zwicklebier (an unfiltered lager), Propeller DIPA (India Pale Ale), Propeller Bock and Propeller Maritime Mild Ale (English Mild Ale).